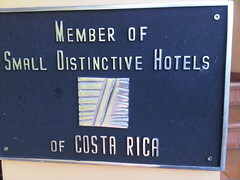 Image by Costa Rican Resource via FlickrAfter visitng many hotels and dropping groups off almost on average 40 weeks out of the year at hotels in Costa Rica. The Grano de Oro has given our guest a 100% satisfaction rate. I think it is because they have kept it nice and small, kept the staff full, and excellent service. Hope you enjoy the blog and if you have comments on the Grano de Oro would love to hear them? The Pozuelo cookie is one of the best cookies Costa Rica has to offer. The family Pozuelo in Costa Rica is a well-known family for generations having started the very successful Pozuelo cookie factory which still sits in the center of San Jose. The Pozuelo family wanted to be close to their cookie factory as most people do, the smell is amazing. The family lived in the center of San Jose in a beautiful home that has now been turned into what we consider the best hotel in San Jose, Grano de Oro. Here we will tell you why? San Jose is filled with some nice hotels just like any capital city. You can find the big Marriots, Real Intercontinentals, and the list goes on which are all great places but if you stay in them chances are you have stayed in something similar before. The Grano de Oro offers something just a little bit different and almost reminds you of a unique place in Europe where so many times you find a great place to stay that is not one of the chains. Grano de Oro is in the center of San Jose five blocks from the Central Park La Sabana. It is completely refurbished but the history behind the whole city is left on the walls through pictures, antiques, and even the people who come and eat in the restaurant. San Jose is not one of those capital cities that is a must-see for tourists. However, when you stay at Grano de Oro you really feel the history as you hear about the coffee boom and the different buildings and places of San Jose. You leave this hotel not only saying to yourself what wonderful rooms, food, and service but you also gain an interest for this capital city which if you look deep enough does have some interesting history. For tourists, San Jose is sort of over shadowed by the volcanoes, rivers, and rainforests of Costa Rica but hotel Grano de Oro lives up to its name as being just a little “Grain of Gold” tucked away in the capital city of San Jose.